iPhone SE Price, Review, Deals, Cost, & Sales! Home / Compare Cell Phones / iPhone SE Price, Review, Deals, Cost, & Sales! The iPhone SE breaks the mold of standard iPhones. Although is significantly smaller than the other iPhones released around the same time, the SE has a just as powerful processor, camera, and battery. The iPhone SE has a much smaller display than the iPhone 6s and 6s Plus, which were released just six months prior. The SE is the first iPhone since the 5s to feature a 4” display. This iPhone has a Retina display, and the screen is protected by a fingerprint-resistant coating. The iPhone SE is the only 4” iPhone to have a 12MP camera. This iPhone comes with great photography features like Live Photos, Panorama, 5x digital zoom, and more. The SE is also capable of recording videos in 720p at 30 fps, 1080p HD at 30 or 60 fps, and 4K video at 30 fps. The iPhone SE is available in two storage variations: 32 GB and 128 GB. Previous 4” display iPhone only had up to 32 GB of storage space, which really sets the SE apart from the rest of the pack. This amount of storage space is more than enough to save lots of photos, music, and videos on your iPhone! This iPhone has one speaker and it’s located at the bottom of the iPhone to the right of the Lightning port (also known as the charging port). To the left of the Lightning port is the microphone, so the iPhone SE’s speaker is in a great location if you prefer to make calls using speakerphone. The iPhone SE has a Touch ID fingerprint scanner built into its Home button. 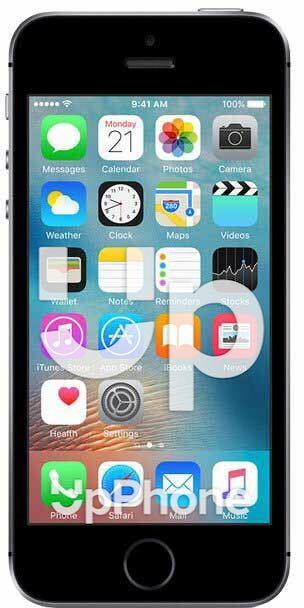 You can use Touch ID to confirm app installations or purchases, unlock your iPhone, and much more! The iPhone SE has the A9 chip, which has a GPU designed to be 90% faster than the A8’s and a CPU designed to be 70% faster than the A8’s. The last 4” inch display iPhone, the iPhone 5s, had the less powerful A7 chip. Despite its small size, the iPhone SE has great battery life. Its battery is designed to last for up to 13 hours of Wi-Fi internet usage, 13 hours of video playback, 14 hours of 3G talk time, or up to 50 hours of audio playback. The iPhone SE was the first to be available in Rose Gold. The iPhone SE was originally released with 16 GB and 64 GB storage capacities, both of which were discontinued when Apple announced they’d make 32 GB and 128 GB of the SE. The iPhone SE has an A9 chip, the same one used in the larger 6s and 6s Plus. The iPhone SE has a Lightning port, not a 30-pin dock connector, meaning you can charge with the newer, smaller charging cable. This iPhone only has one speaker, but it’s located right next to a microphone, making it great for speakerphone calling.